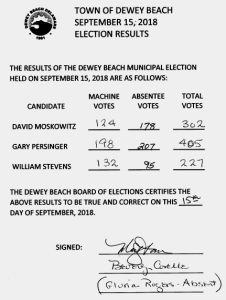 Voters in Dewey Beach have selected incumbent Gary Persinger and newcomer David Moskowitz to fill the two commissioner seats that were up for grabs this election season! 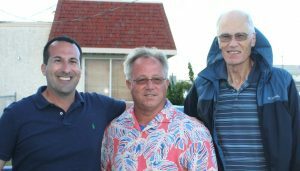 The winners of the 2018 Dewey Beach commissioner race, David Moskowitz, on the left, and Gary Persinger with Mayor TJ Redefer in the center. Image courtesy WGMD/Alan Henney. David Moskowitz with 302 votes. Gary S. Persinger, the only incumbent, had 405 votes. William J. Stevens with 227 votes. Dewey Beach Mayor TJ Redefer said Saturday that the candidates will be sworn-in at the organizational meeting that is currently scheduled for next Saturday, Sept. 22, but Comm. Persinger has a schedule conflict, so it could move to the following Saturday, Sept. 29, at 6 p.m. He hopes to have the date confirmed this Monday. Previous articleThe Popular “Acoustic Jam Night” Returns to Rehoboth Beach Museum!